I thought to help spread the photoshoots apart, I would add in anything random that might interest some of you who might be looking to pick up a camera and start shooting, or already have one and want to know more. I am in no way trying to create a tutorial website or be a mentor to anyone but I can try to create a better understanding of things to help fellow photogs. Whatever I’ve learned over the years has helped me greatly through practice, practice, and more practice. My resources in the beginning were car forums with other aspiring photographers wanting to learn the ropes. I was lucky enough that around the time that I was getting into it, it really started to explode in the automotive scene. Not many people had access to dSLR’s, and when there was an awesome picture, we would all be in “awe” over it. That’s the main reason I wanted to get into photography – all of these awesome looking cars deserved to be showcased in a better way than point and shoot and sucky angles. I was one of those guys taking pics with a point and shoot and while it was “decent”, it wasn’t good enough. Rewind back to about 6 years ago when I first got my dSLR… I was just like you (The guy who just got his dSLR). I shot on auto for a bit. I found out about RAW files and their capabilities within programs like photoshop or lightroom. I then decided to make the ballsy move of switching my settings to “M” (manual) and tried to compensate for aperture and shutter speed myself. Pictures turned out overexposed, underexposed and almost never perfectly exposed. “There has got to be an easier way” I said to myself. I finally decided to hit the books – find out what shutter speed and aperture do, what ISO means – why and how it all comes together to make a good picture. I quickly found out about the “rule of thirds” and composition, how depth of field (DOF) plays a part in creating a picture, how background and light can make or break the photo. Soon enough, all of these things (and much much more) finally mix together in your head and you finally understand it. Taking a picture is more than just aiming the camera and pushing the button like a lot of people think. When it all comes down to it, taking a picture is a combination of putting everything you know about the camera, light, subject and background to create a “great photo”. Note: I’m going under the assumption that the general audience of this understands what ISO, aperture, and shutter speed do and how they work together. I’m happy that I kept bad rolling shots on my hard drive because now I can illustrate my point. 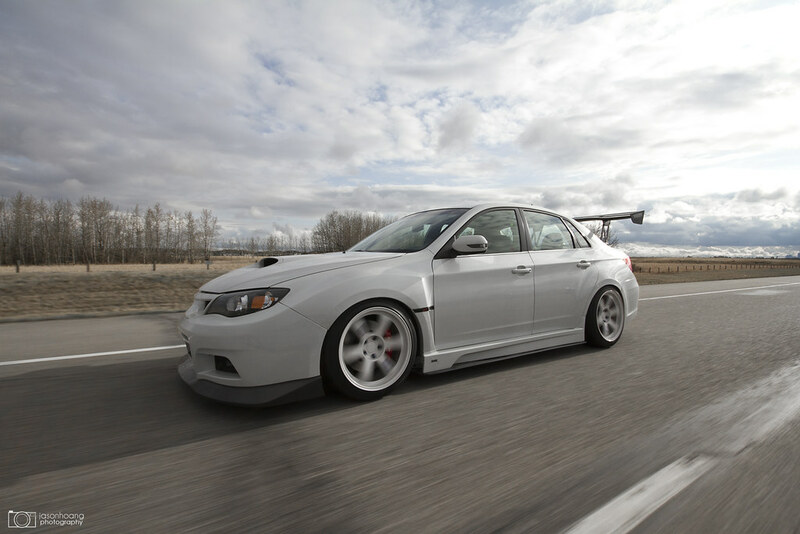 This is a good example of a bad rolling shot. It is unedited – so we’ll stay away from the fact that the sky is overexposed and the car is underexposed – that can easily be fixed. Let’s focus on the shot itself – there are a few things wrong with it. The biggest issue is the lack of spin in the wheels. The wheels look like they’re barely moving even though we’re going at about 80km/h in the shot. The angle is kind of unflattering but it would’ve been OK if the wheels were spinning. All in all, the car looks like it’s going 20 km/h. Why? First – the issue is not the ISO. ISO can help increase shutter speed in low light, but it is not needed in this situation. The aperture and shutter speed – aperture of F13 is generally OK but with the lighting conditions of this particular shot – it may be a bit too small. The aperture in this scenario is causing the shutter speed to be way too fast. 1/250th of a second means that the shutter isn’t staying open long enough to capture movement in the wheels, but it’s quick enough to keep the car clear. On the flip side, if the shutter speed is open too long then you will get a blurry picture. Notes: Taking a rolling shot with the sun against the camera – like the photo above – is most difficult IMO. You will end up with two likely scenarios: 1) The same one above. Overexposed sky, underexposed car, and slight spin in wheels. Or 2) Underexposed sky, overexposed car, spin in wheels, but a blurry picture overall. Different scenario here. The sun is now behind us – which is ideal. I always like to shoot with the sun behind the car, in front of it, or on top of it. You need to keep shadows in mind too – if you shoot with the sun in the same direction as your camera, you’ll likely get a shadow from the chase car cast onto the subject car. In this shot, the wheels still aren’t spinning much and we’re going 110km/h. It’s fast enough, but why won’t the wheels spin? You guessed it. The shutter speed is still too high. How do we compensate for that then? We make the aperture smaller (make the number bigger). By doing this, the camera will decrease shutter speed and you should get what you want. Keep in mind, your biggest deciding factor on what your aperture should be is the light. Depending on your lighting conditions – your aperture will change. This is something you’ll learn as you practice it. My general rule of thumb is to start at F10 if we are shooting mid-day. If the pictures turn out blurry, increase the aperture (make the number smaller). If you are not getting wheel spin, decrease the aperture (make the number bigger). Another example. You’ll notice the changes as we go through these. So a few things to note here – aperture is now at F18 and shutter speed has gone down to 1/80th of a second. You’ll notice that the wheels are spinning a little bit more, but it’s not creating a full spin effect. Why? 1/80 is significantly slower than 1/200th like above, but what’s changed? The speed of the cars. The speed in the previous picture was 110 km/h. The speed in this picture is about 50 km/h. So while the shutter speed is slower, the speed of the car and the amount of rotation in the wheels just isn’t cutting it. Start taking notes. Here is the perfect example to put the two examples above into perspective. So we have the sun behind the car. The aperture is F13 (good). The shutter speed is 1/125 – faster than 1/200 in the second picture and definitely faster than 1/80 in the third picture, but where the second and third picture didn’t work – this one did. Why? Let me break it down – in the second picture, we were going 110 km/h but the shutter speed was too fast at 1/200th of a second making the wheels look like they weren’t spinning. In the third picture, the shutter speed was slow like we wanted but we were going too slow at 50 km/h to show any wheel spin. Now for this picture, we are going 110 km/h and the shutter speed is not too fast and just slow enough to capture multiple rotations of the wheel to create the wheel spin effect. Another example in conjunction with the one above. This is the exact opposite situation. Now we are going 50 km/h, but the shutter speed is 1/60th of a second – slow enough to capture wheel spin at the speed we are driving at. The only variable in these two situations is that the lighting condition is different. The previous example is quite bright with the sun shining down, while this example is overcast with no sun. Adjusting aperture to compensate for lighting is crucial. 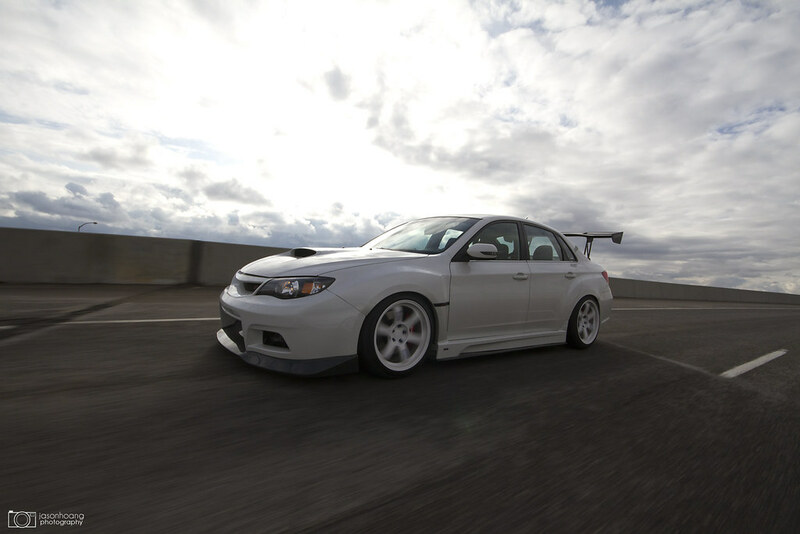 If you forget about factoring light into the equation, you’ll have a tough time with rolling shots. Now let’s move on to my worst nightmare. I say that it’s my worst nightmare because I hate blurry pictures. I hate blurry rolling shots even more but it is inevitable unless you have hands and arms that are so aerodynamic and resist any sort of wind and shaking. Let’s point out the good: The wheels are spinning perfectly, the road is in motion, and the background is in motion. The bad: it’s blurry. Frankly – nobody cares for a blurry picture. If you wouldn’t set it as your desktop background, nobody else would either. What’s the issue? The main issue is that the shutter speed is way too slow for the speed we are going. Again, at 110 km/h – it’s easy to capture spinning wheels at a faster shutter speed because they’re moving so fast. At 1/20th of a second, the shutter is open too long and that creates a window for shakiness and movement of the photographer to come into play. If the aperture were F9 and shutter had been at 1/60th of a second, I’m certain this picture would’ve come out a lot differently. Night time rollers are a little different than daytime rollers. So whatever you know about daytime rollers now (which you do), do the exact opposite. We know that for daytime rollers we need several things: A small aperture, a slow shutter speed, a low ISO, and to compensate for lighting depending on the situation. So like I said – exact opposite. This means we need a big aperture, a fast shutter, and a higher ISO to help increase the shutter speed and compensate for light at the same time. In this particular shot, I waited until we got under the overpass to use that light and quickly increase the amount of light going into the sensor. Now we move onto more examples of some “good” rollers that I’ve taken over the year. I’ll include the EXIF info for you to compare the lighting in the shot and what the camera settings were for your reference. Notes: Lighting is perfect. Shutter speed is bang on. You have movement in the ground with the background nearly still but there is still a sense of movement in the picture. Wheels are fully spinning and you can clearly see the brakes. Speed is around 110 km/h. Notes: The lighting in here is going away quick. It’s during sunset so you can’t use too small of an aperture or else your shutter will be open for a tad too long. For this shot 1/30th of a second is a bit slow but not too slow to miss capturing rotations in the wheel. We are also traveling at about 100 km/h here. Again – another shot at sunset so there is less usable light but with a slightly bigger aperture and a slightly quick shutter, you can get good effects at sunset. This one in particular has the sun somewhat behind the car and somewhat pointing to the camera. This works because at sunset and sunrise, the sun is less harsh and “white” and so it doesn’t create an overexposed look to everything. Instead, you get the nice yellow/orange look to the pic and sometimes if your camera is angled just right, you can get a nice sun flare that doesn’t interfere with the subject. Another one shot at around 90 km/h. This shot was a lucky one. The shutter speed is at 1/15th of a second and that’s when things can start to get shaky. If you have enough light, you can sometimes get away with it like here. If you are able to hold your hand steady and the cars are both in-line and there are no bumps, you can get a clear rolling picture. The beauty of a longer shutter is that you not only get the wheels in motion, but you also get the background in motion too, even if you aren’t going that fast. This shot was at about 60 km/h with the sun over top of us. This is a great example of when things all come together perfectly. Shooting a silver car is awesome because it doesn’t reflect all the light like white cars do and it doesn’t eat all the light like black cars do. What’s even better is that the wheels are white/chrome so it has the same effect. It’s significantly easier to get a rolling shot under most conditions with a silver car and bright wheels than it is with any other colour IMO. This was at around 110 km/h as well and I could have been anywhere between 1/50th of a second up to 1/100th of a second and both would have worked well. Nothing special about the shot or the lighting conditions here. A pretty standard aperture and shutter speed – traveling at around 80 km/h. One thing to note about rollers with two or more cars is that you need both in focus now and not just one. If you have only one in focus, then the shot is “ruined”. That’s another reason why it’s best to work under “aperture priority” on your camera when shooting rollers because you want to control how big your aperture is and let the camera focus on what your shutter speed is. You don’t have a lot of time to do both when you’re doing rollers so while you work on aperture, the camera does shutter speed. I’ve had some people ask – why not shoot in the larger aperture range? By shooting in a larger aperture range like F4 or even F1.8, you get a lot of depth of field and not enough in focus. For rolling shots, you want as much of the photo to be IN focus as possible since there’s a lot of movement going on – the subject is rolling, the chaser car is rolling, the cars are swaying slightly, the background is moving, and your arms and camera are moving. By shooting in the smaller aperture range like F9 and F13, it ensures you get as much of the subject and background in focus as you can while all that movement is happening. The last scenario is one where you get a bunch of tricky combinations together. That is: a white/bright car, dark wheels, and low light like overcast or sunset. Here’s what the challenge is: You have a bright car that loves to reflect light but you have dark wheels that love to eat light. First, you’ll either have an overexposed car if you focus on the wheels or you’ll have underexposed wheels if you focus on the car. This means in the first scenario (overexposed car), the wheels will likely not be spinning much. In the second scenario (underexposed wheels), the wheels will be spinning but everything else will be blown out. In this scenario, I like to direct the focus onto a part of the car that is neutral. (You didn’t forget about focusing and aiming, did you?) So for these shots, I like to focus on the amber corner of the headlight or a part of the windshield, or the H emblem on the grill. By doing this, you get a neutral exposure that gives you a nice medium. Always use a central point on the car that allows you to get the best focus as an end result. Here you can see the camera settings are at F5.6 and a fast shutter of 1/125 because of the lighting – there was no more sun, so we use the light that illuminates the skies after sunset. And voila! 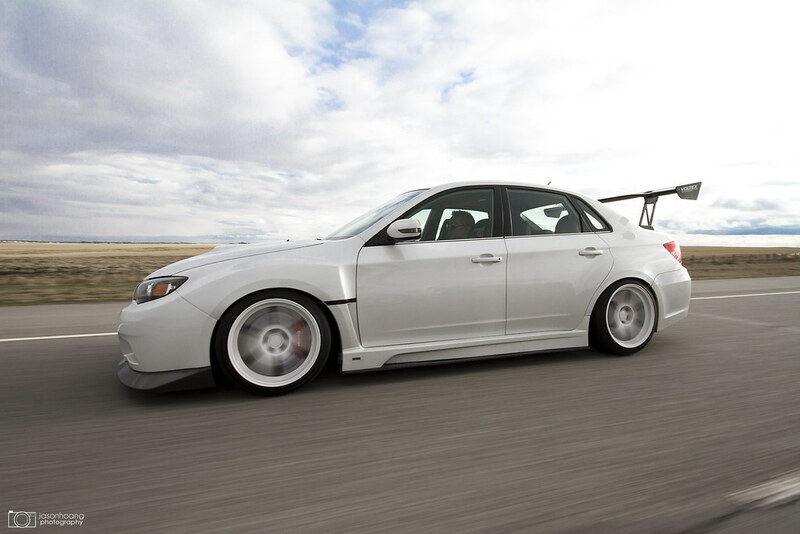 You know how to take rolling shots! 1) Aperture – what should it be set at given the lighting conditions? 2) Shutter speed – by shooting on aperture priority, the camera will adjust it’s shutter speed according to lighting conditions. If you want a faster shutter because there’s too much blur, increase your aperture (make it smaller). If you want a slower shutter speed because nothing is spinning or moving, decrease your aperture (make it bigger). 3) ISO – do you need to compensate for the lack of light? ISO should be increased when it starts to get dark. There’s no need for graininess in a picture if you don’t have to have it. 4) Speed of the cars – how fast are you going in relation to what your settings are? If you’re traveling at a high speed, you won’t need a slow shutter speed to capture movement. If you are traveling at a slower speed, you’ll need to also slow down the shutter to capture the rotation and movement. Conclusion: What’s the biggest determining factor of rolling shots from the points above? Light. Light will determine everything you do. The position the sun is in (if you’re shooting mid-day), the position of shadows to ensure the shadow of the chaser car is not cast on the subject. The type of light that is being used – super bright afternoon sun or artificial lamp post lights at night. Any questions – feel free to comment! Hope this helps someone! Very informative post on rolling shots! Definitely a keeper. Thanks! Glad you found value in it! Thanks for the feedback! nice information! thx for sharing! but, how about if i have to shoot many cars in a cruise? like 3 or 4 cars rolling together? Glad it could provide some useful information! If you are shooting many cars at once, it’s best to let them know what the plan is before you go out onto the road. I usually let them know who is up front, who is in the back, etc. I’ll also let them know that they should keep their speed and we (as the camera car) will adjust our speed accordingly. Shutter speed/aperture should follow the general guidelines of how much light you have. Dude, this write up was sweet! I just picked up the camera today because I want to start shooting the crew a buddy and I just started up. This is a HUGE help. Very in depth and informative. Best I’ve read yet. Thumbs up fyi as this is what I am looking around from real person doing it. But do you mind sharing how to make a low level angle shoot? Thanks in advanced! To be honest, any low angle rolling shot that I take is one where I am out of the window and my camera is as low to the ground as I can reach. Most of the time, you’re leaning out of the car while you’re doing it. Just gotta be careful. Had a browse on WordPress and came across this. Thanks a lot for putting up something so informative :), I’ll have a go myself at some point soon! Awesome write-up! But if I shoot in night, artificial light, do I use a flash? Thanks! I personally don’t, only because flash creates another source of artificial light that takes away from the “night time roller” look. It’s difficult for sure because you have to play with your settings like ISO and aperture properly in conjunction with shooting when the subject car is under a lamppost or near a source of light that will give you a few seconds of a quicker shutter. If you take a look at the picture above of the 240SX at night, you can see that it was under a bridge with lights and I used the lamppost just behind the car to speed up the shutter. Once we were out of the bridge, it was back to slow shutter and minimal light. The rest of the details can be brought out in post-processing.